Visitors to Houston will immediately notice the modern, big city skyscrapers towering over the city. What they may not realize is that a recreational mecca called Memorial Park lies in the shadow of those downtown hi-rises. Boasting 1,500 acres of wooded paradise, the park is a hub of outdoor activities lovingly nestled in the heart of a thriving metropolis. On any given fair weather day, Houstonians can be found taking advantage of a number of well manicured sports facilities at Memorial. Most widely known is the beautiful Memorial Park Golf Course, the nationwide crème of the crop with regards to municipal courses. With 18-holes spanning over 250 acres, it lures more than 65,000 avid golfers annually. An impressive array of sports fields play host to year round softball, baseball, and soccer leagues in the park. There are also 18 hard surface tennis courts, along with a practice wall, a full pro shop, and locker/shower facilities on site. Also nearby are the croquet courts, where the Houston Croquet Association thrives. For the volleyball enthusiasts, four sand courts are available on a first come first serve basis. Get there early, they fill up fast! No major park would be complete without a running trail. Memorial’s answer is the three mile Seymour Lieberman Exercise Trail, a scenic, crushed granite loop complete with lights, restrooms, water fountains, and exercise stations. 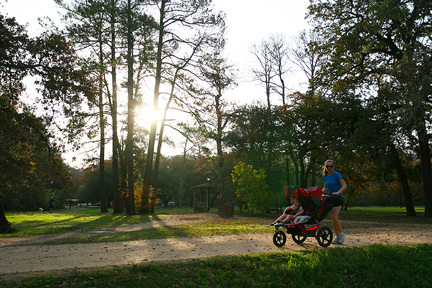 The loop is popular with joggers and walkers of all ages, and it is even dog friendly. In addition, various vendors often hand out free samples of their wares along the trail, with offerings such as vitamin water, energy drinks, and t-shirts. Those that prefer to exercise on wheels can cycle or skate on the Memorial Park Picnic Loop, a smooth road encircling expansive family picnic grounds. However, if the aroma of grilled hamburgers is too much to bear, or if an off-road experience is preferred, then six miles of well kept dirt trails await. 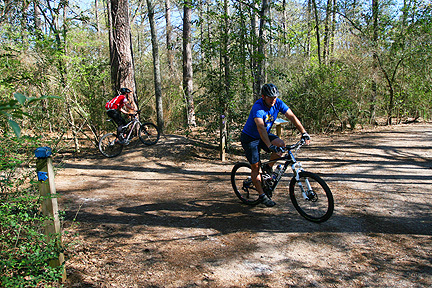 Mountain bikers and trail runners can enjoy a well-marked, color coded system of wooded trails which are meticulously maintained by the Greater Houston Off-Road Biking Association. The trails may close after inclement weather in order to preserve them, so call the trail hotline at (713) 221-0499 to check for closures. Last but certainly not least, the Memorial Park Fitness Center offers a more laid back alternative to crowded, big chain gym complexes. The center hosts a multitude of free weight and resistance training equipment, with trainers on-site to aid and instruct patrons on proper use. A swimming pool is also an alluring attraction during the summer swimming season, and the center is equipped with first rate lockers and showers facilities. Pay a small fee for daily use, or sign up for monthly membership that won't break the bank. Call (713) 802-1662 for more details. 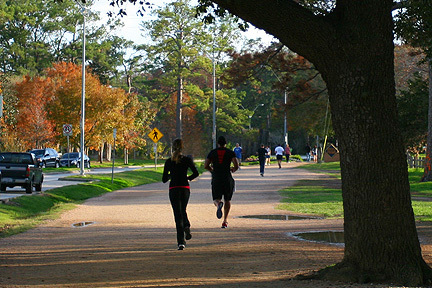 Golfing, jogging, cycling, swimming, there is something for everyone at Memorial Park. Whether its bringing the entire family for a picnic, going for a solo ride, or training with friends for a triathlon, Memorial Park has it covered. For more information, visit the park's home page.